Really enjoyed this Hardy title, and found that as the book progressed, it became harder and harder to put down and go and do “real life” things. I ended up doing a marathon read last night and was really immersed into Wessex and the lives of the villagers that Hardy had conjured up. What I was most interested in this read was the difference in vocabulary and references that Hardy uses in his writing. It’s been a while since I have needed to do a “New Words to Me” blog post, but reading Hardy helped me to add a lot of new words to that list, along with loads of references to biblical and Greek/Roman myths. Is it because the older (read: Victorian) writers wore their learning lightly and made these literary references assuming that the reader would know them? Or were these older writers being elitist and showing off their education to their readers? Would the average reader at the time of Hardy know his references to Ixion’s punishment and when “the sailors invoked the lost Hylas on the Mysian shore”? Or were his readers just as puzzled as I was (and hitting the books to find out more)? Another curious point is the link between the main female character -- Bathsheba Everdene -- and the more current heroic character of Katniss Everdeen in “The Hunger Games”. I had wondered if there was a connection between the two, and in further research, it seems that HG author Suzanne Collins did name Katniss as a homage to the Bathsheba character – both have strong independent characters that don’t always go down well in the society in which they live, both have similar romantic issues (Katniss/Peter (I think), and Bathsheba/Gabriel)… I wonder how many teen readers know that as the reference? Probably not, I would think, which is a shame as Hardy is a great read. Speaking of literary influences, now I am curious to re-read Posy Simmonds’ graphic novel Tamara Drew which heavily references Far From the Madding Crowd. When I first read the Simmonds’ work, I hadn’t read this particular Hardy title so probably ended up missing a ton of references. I’m interested now to go back and re-read the graphic novel and see the parallels between them. 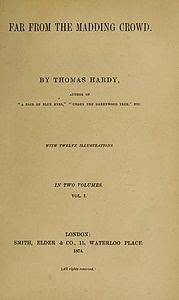 It’s a shame that more people don’t read more Hardy – I think they think of him as writer of tragedy and sadness, but if you read his Wessex books, they are pretty light-hearted and funny at times. I’d almost classify Hardy as a rural more down-to-earth Jane Austen in some ways, but people tend to get stuck on the disastrous story of Tess and get scared off. They’re missing out. Say Hello to Our New Contributors!